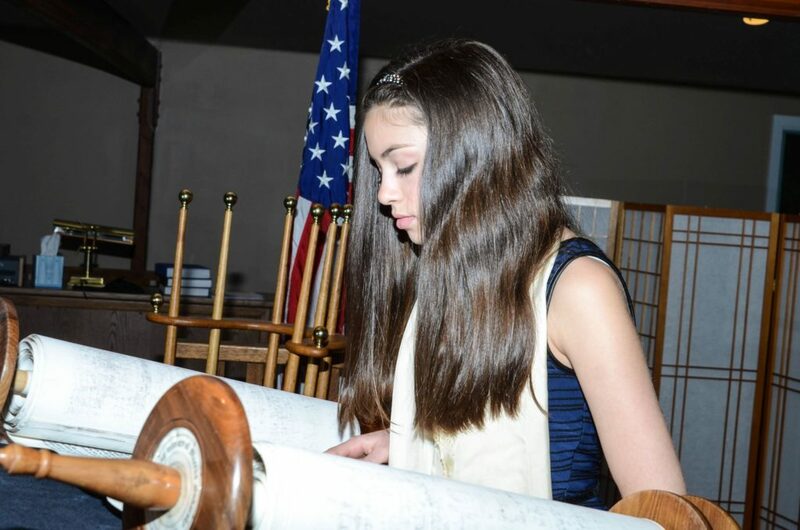 Becoming a Bar/Bat Mitzvah is a major life cycle event for our youth and for adults who have never experienced the ceremony of Bar or Bat Mitzvah as a child. It’s a celebration to be shared with family, friends, and our congregation. Rabbi Bekah oversees the Bar/Bat Mitzvah program for our youth and is responsible for making sure that all of our children are prepared for their “special day”. She enjoys making the process meaningful, educational, and spiritual for our young people and she’s excited to be a part of a “team effort” that brings Judaism “to life” for our students. Her many responsibilities include training for the reading and chanting of Torah, Service prayers and the role of leading the service. Rabbi Bekah uses her insights and rabbinic knowledge to help create a brief “sermon” that each child delivers at his/her Bar/Bat Mitzvah and our Religious School Principal, makes sure our Bar/Bat mitzvah candidates are prepared with their prayers. The culmination of this team effort leads to an understanding for the student of why this day is special, meaningful, and will be an experience that will always be remembered. Because FVJC-Emek Shalom views this as an event to be shared with the entire family and our congregation, the Religious Committee with the clergy, have established certain requirements of our youth to ensure that all B’nai Mitzvah students follow approved guidelines. Manual details these expectations and discusses the learning process for youth used at FVJC. It also includes other important information for parents. Parent informational meetings are conducted three times per year involving those parents whose children are at a particular stage in their learning. If you have questions about any aspect of youth B’nai Mitzvah, please contact Rabbi Bekah. One opportunity we have at FVJC-Emek Shalom is for individuals who have never experienced the ceremony of Bar or Bat Mitzvah as a child for themselves to do so. We provide a two year course of study with the rabbi and at the end of two years it culminates with a group Bar/ Bat Mitzvah ceremony on a specially selected Shabbat in the spring. The course of study ranges from history to Jewish law, from mysticism to reading Hebrew and from the study of prayer to the study of Jewish literature. This program is open to all congregants who have always wanted to become a Bar or Bat Mitzvah and have never had the opportunity. We meet on Sunday mornings in the rabbi’s study where he unfolds the world of Judaism before his students. Questions are answered, where there is a particular interest we delve deeper into the material and at the end of the source of study there is the opportunity for students to enter into an Adult Confirmation Program with the rabbi. The rabbi leads a congregational tour of Israel every other year and when she does, there is the opportunity for students and adults to become Bar or Bat Mitzvah in Israel. The ceremony takes place on top of Masada and the entire tour membership is present as the congregation that day. It is done on a Monday or Thursday morning as those are the mornings that we read the Torah and anyone who has studied with the rabbi has the opportunity to have a Bar or Bat Mitzvah in Israel in addition to or instead of a Bar or Bat Mitzvah in Simsbury at the temple. The travel to Israel usually is a two week trip with sights and activities for all ages groups and for all religions. One needs to talk to the rabbi directly to arrange for this type of Bar or Bat Mitzvah. The Farmington Valley Jewish Congregation-Emek Shalom is a diverse synagogue that offers educational and spiritual activities to everyone. No one is denied the opportunity to participate, be involved, or feel a part of the community in every facet of Jewish life. We offer the opportunity for those with any kind of educational deficit or disability to become a Bar or Bat Mitzvah as part of our congregation. Every student is treated as an individual and is tutored as an individual and has a Bar or Bat Mitzvah ceremony and celebration that is customized for them. We take the needs of all of our students quite seriously and never make a judgment upon any student in terms of their disability where they cannot participate and be involved in having a Bar or Bat Mitzvah if they so desire. We believe that it is every Jewish student’s right and privilege to become a Bar or Bat Mitzvah at the appropriate age and work to make that happen. The rabbi should be contacted for any further discussion about this topic.